Other than a few small issues, I really enjoyed reading 13 Little Blue Envelopes, the first book in this series. I enjoyed reading The Last Little Blue Envelope as well! Having just finished the first book, it was nice to hop right on to the second book, and still have it all in my memory. I have to say, I still had the problems with this book that I had with the first book. A young girl traveling across the country, with people she barely knows. At least she wasn’t completely alone this time, so that was something. I think I connected a little more with the main character, Ginny, this time around. She showed a lot more emotion, although not so much in the beginning of the book. (Come on Ginny, you’re in London, at Christmas!) In my review for the last book, I said I hope to see more of Keith in The Last Little Blue Envelope. Well, we definitely see more of him, but I have to say I didn’t care much for him. We are also introduced to two new characters in this book. (Ellis and Oliver). I really, really liked Oliver right from the start, and didn’t care for the way he was treated. I love Uncle Richard; I’ve liked him from the first book, and wish he had a larger role in this book. 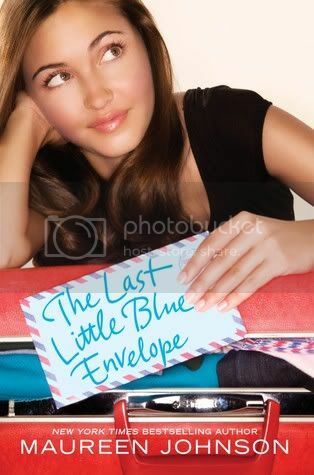 The storyline in The Last Little Blue Envelope was interesting and quick paced. It kept me wondering what was going to happen next. There were also quite a few laugh out loud moments! I enjoyed following Ginny on her journey around Europe once again, especially when she visited Ireland. I hope to one day visit there myself. I can’t say I am satisfied with the ending of the book. It kind of left me hanging. There’s definitely room for a third book, (hint, hint), and I would love to see what Ginny does with her future. And I would totally love to see more of Oliver and Uncle Richard! If you enjoyed the first book, you will most likely enjoy this book as well. I know I did. A BIG thank you to HarperTeen and Netgalley for allowing me to read and review this book! I am looking forward to startin this series soon! Sounds like a fun read. I am excited to read the Ireland parts as I have been and LOVED it (hope you get to visit soon). Awesome review! I have to connect with character, but I can overlook most other things. I'm so completely jealous that you got a copy of this book. I cannot wait to read it. Unfortunately, I don't start my job for two weeks which means I'll be waiting a month to get paid. Grrr. i pre-ordered this novel without reading the first one but i just know i'm going to like 13 Little Blue that i'd immediately want to read Last Little Blue. I'm glad I'm not the only one who wasn't completely happy with the end! I think that's just because, like you said, she seems to have left it open for another book! Great review!